If you have a friend with whom you can share your innermost fears and doubts, express happiness and distress without fear of being judged, a friend who has no expectations from you whatsoever but gives herself selflessly then one needs to consider oneself fortunate. And I consider myself fortunate to have one such friend with whom I was reunited a few days ago, after 8 long years. 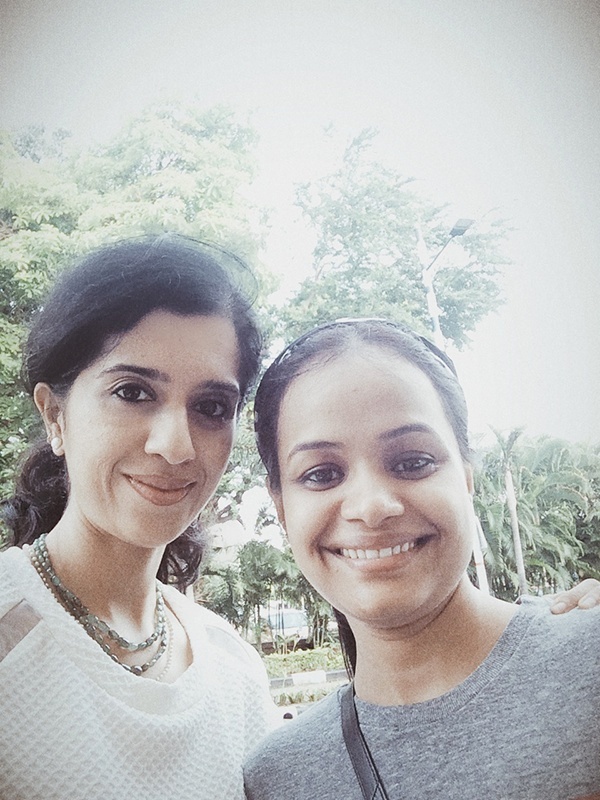 As I waited at the airport for Pankaja to arrive from New York City, my mind flashed back to us as young girls filled with dreams and aspirations. We were two friends and classmates with similar goals and interests in life. As the years went by, destiny had charted different routes in our lives as she pursued design and I studied management. To begin with our lives were separated not just by our choice of careers but also by our places of dwelling. It began with different cities and then moved on to different continents as my amazing friend, braving all odds, circumstances and personal trajedies pursued her calling in life. Food was ofcourse one common factor in our lives. Riding to our favourite place to eat samosa and kachori with the spicy accompanying chutneys after college and then having a cone of our favourite ice cream was a ritual. And so was eating in each others houses, both of us enjoying one another’s mother’s cooking. As I have said before, Pankaja is a great cook and one of the best memories I have of her cooking are her Aloo Tikkis with the accompanying red and green chutneys. The chutney recipes I’m sharing with you today are the ones that I have devised over the years with trials and errors in my kitchen. Much like revered French sauces without which some French dishes are inconceivable, these two chutneys (or sauces as you might want to call them depending on the consistency that it acquires based on how watery/thin you want them) are the masters of Indian street food, also enjoyed with many Indian snacks. These chutneys can be slathered on bread to make Indian style sandwiches, sprinkled over dahi wadas and served as an accompaniment with samosas, kachoris and parathas. Indian chaats like bhel puri, sev puri, dahi batata puri are unthinkable without these chutneys with their many different flavours and tastes. These two chutneys have a myriad different flavours and tastes and produce a variety of taste sensations on the palate. They also seem to have the six different tastes described by Ayurveda. The green chutney has the spicy (from the green chili), salty (from the salt) and astringent (from the lime and mint) tastes and the red chutney has the sweet (from the dates and jaggery), sour (from the tamarind) and bitter(though very slight, it arises from the cumin) tastes. Years ago, I noticed a chaatwala on the streets of Mumbai adding peanuts to the green chutney. I tried using almonds here as I had an overdose of peanuts from all the laddus that I made for the various festivals. Almonds are just perfect here. But feel free to replace them with peanuts. 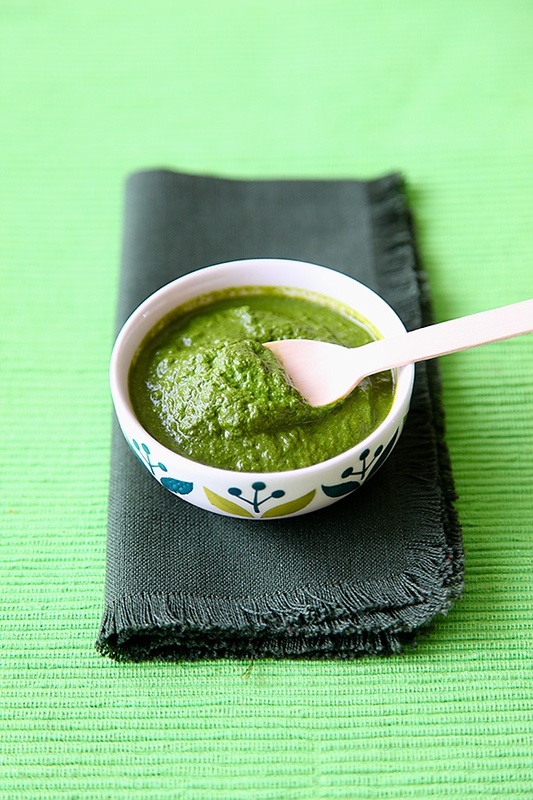 This green chutney is not just vibrant in colour but also great in taste. 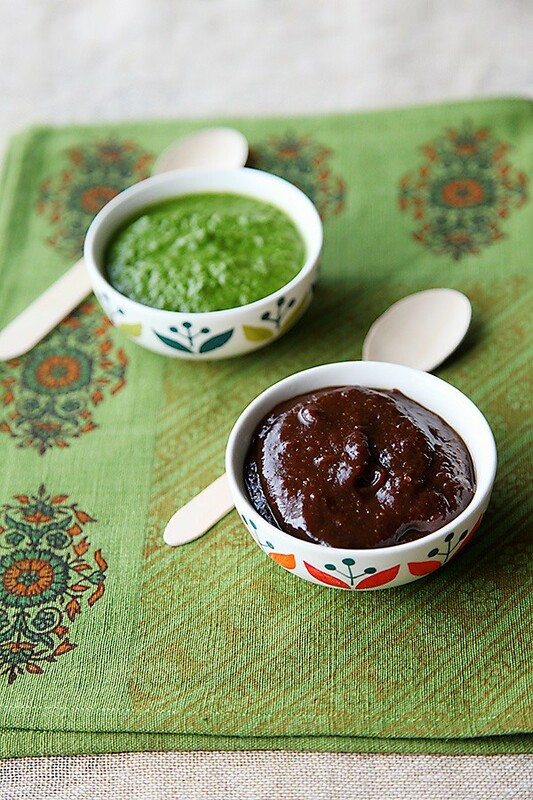 I love eating this chutney with finger millet (ragi) dosa as well. 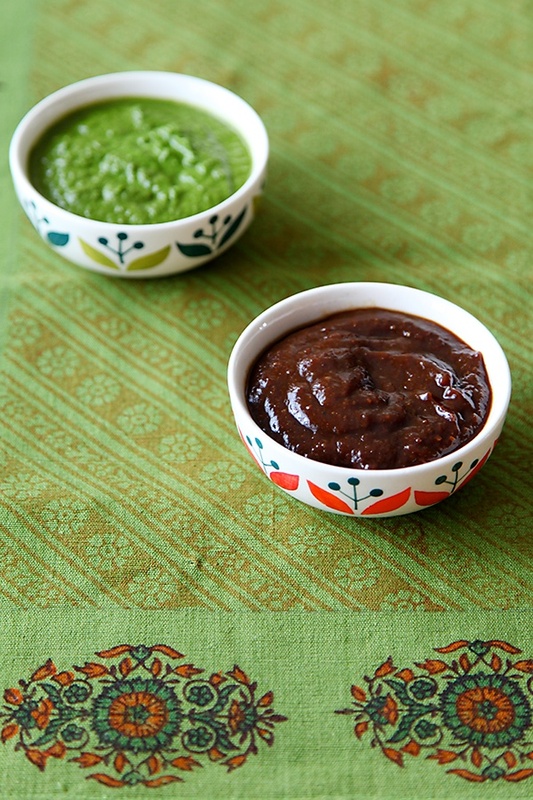 The date and tamarind chutney is smooth and sweet with a gorgeous velvety texture. It is sweet, sour, salty and a little spicy as well. You can imagine the zesty character of this chuntey with all these taste factors in the picture. It can perk up many meals and take them several notches further. This chutney freezes well, so of you make a large batch you can freeze it in several containers. You can savour these chutneys individually or serve them together to experience the many different flavour quotients provided by them. You can also make them to the consistency that you desire depending on your taste or the suitability for the dish in question. And depending on that you can keep the chutney thick and smooth or thin it down with water, adjusting the spices accordingly to liquefy it further. The spices used in these chutneys help to digest the heavier accompaniments like pakoras, vadas, chaats and parathas. I was brought back to reality and shaken from my trail of thoughts when I saw Pankaja coming out of the terminal. As I hugged her my eyes welled with tears, I jumped in glee and it was as if we had parted yesterday. We spoke, ate, shared and exhanged feelings, thoughts, emotions and food and in the bargain created more memories to savour along the way. 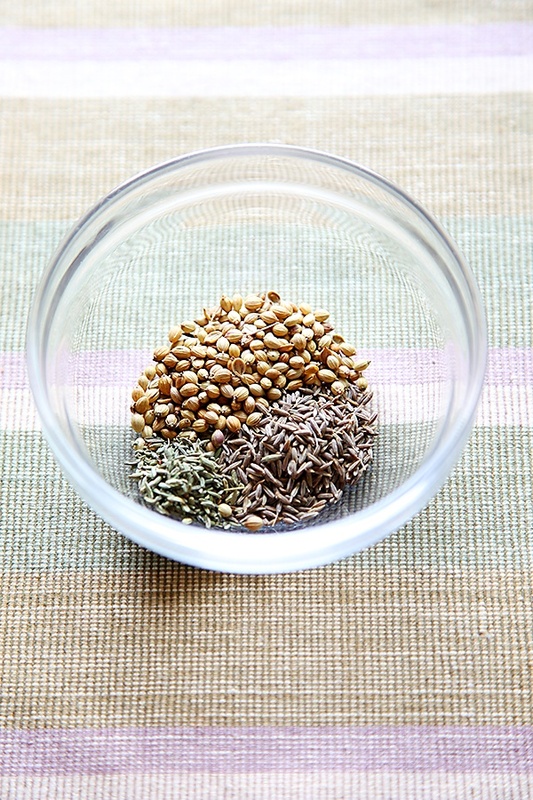 In a wok or skillet assemble the cumin, coriander and fennel seeds and dry roast them for about 2 to 3 minutes. Powder the roasted seeds in a mortar and pestle or a spice mill. 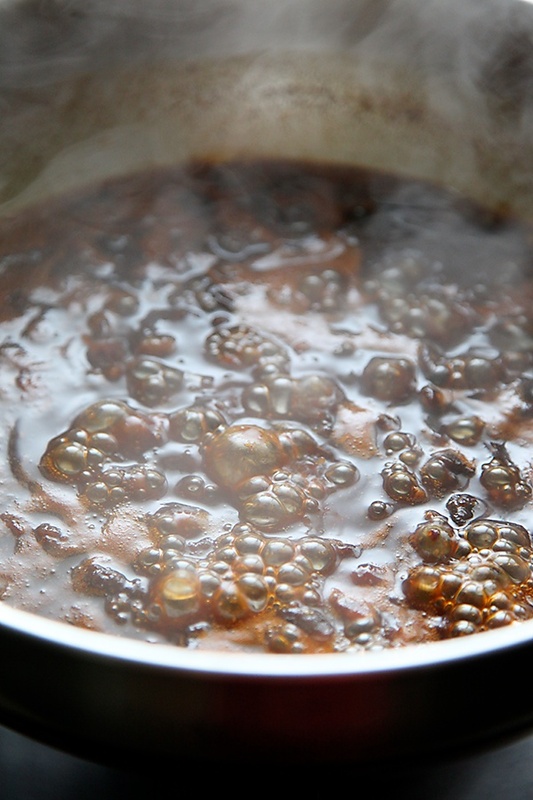 In a wok or kadhai put in the desseded dates, cleaned tamarind , jaggery and 2 cups water. On low heat, bring the entire mixture to a boil. This should take about 8 to 10 minutes. Once the mixture starts to simmer, put in the powdered spices, red chili powder, dried ginger powder, asafetida and the salt. Raise the heat to medium low and cook for 4 to 5 minutes more until the mixture thickens. Allow to cool and then blend in a mixer or a grinder. P.S- Adjust the consistency according to your liking by adding more water. If you like your chutney spicy you can add in more red chili powder and black pepper powder as well to increase the spice quotient. In a blender or food processor put in all the ingredients and blend to a smooth paste. Adjust the consistency of the water as required. This is what I love about your blog. Its not just for recipes, somehow you manage to connect to your readers (especially me) with your thoughtful writing. You always make me want to read on and on…..your posts are so interesting and nostalgic…..Someday I am sure you are going to write a wonderful book on relationships (with eye catching pics) and it will be a bestseller!!!! I will be the first one to buy. 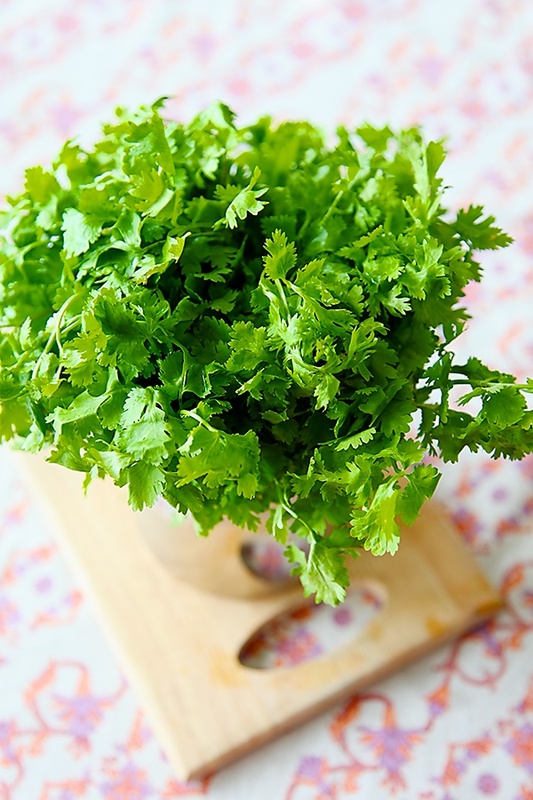 Love the bright green colour of the coriander leaves…..such lovely clicks. And your friend is as beautiful as you. And the recipe…perfectly explained as ever. Didn't know that these cold be preserved frozen. Thank you so much for that info. Just one question though..will the green colour remain as such even after being frozen. I am too fond of the bright green colour in the chutney but somehow in the past mine has turned a dull green/brownish after grinding/storing…Kindly advise. Take care and look forward to reading your next post. This post made me call up my best friend right away! Thanks for your beautiful writing. Very nice green colour of mint and coriander chutney, very nice recipe of tamarind and dates chutney. Thanks for sharing. 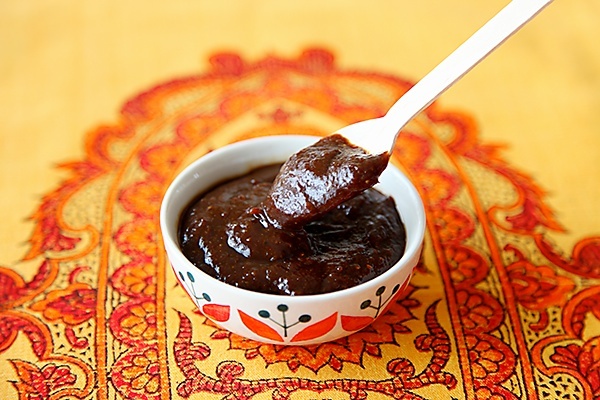 Looks lovely Anu…I simply love date chutney a lot! Love the pics. Shirley: I really appreciate your honest and genuine thoughts. And this definitely inspires me as well. I havent tried freezing green chutney for a long time. If you have a crowd to feed and lots of dishes to make, you can make the chutney, a day in advance and there is no difference in colour as such! But the date chutney freezes very well without any change as such. 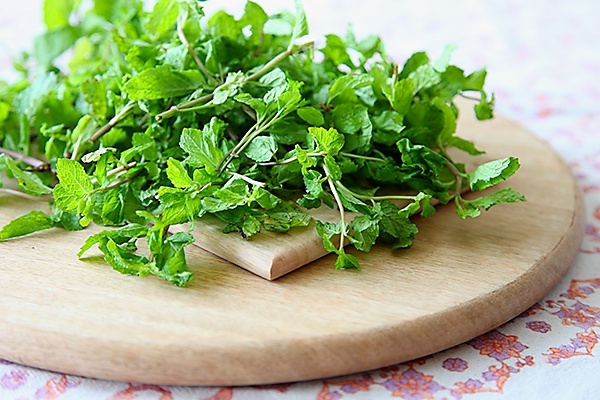 Try and use fresh green herbs and if the chutney has the right amount of acidity then you should not have any problem with the colour as well. Steaming Pot: That's amazing! I'm touched indeed that my words could have that impact. Thank you as always. How long will the chutneys (esp the green one) last if not frozen ? 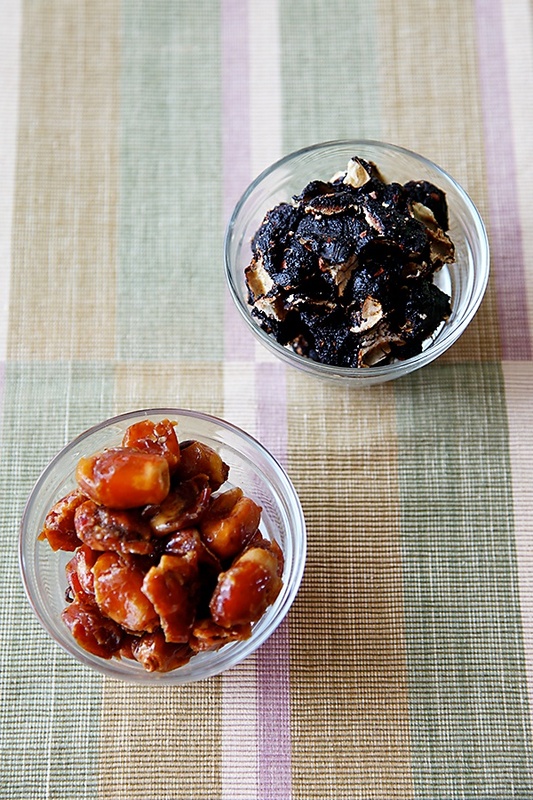 BombayDuck: The date and tamarind chutney will last for 4 to 7 days. The green chutney needs to be eaten fresh. Although I'm not a fan of frozen food, it is best to store it in the freezer if it needs to be consumed the next day. It can be divided and stored in separate containers and can be frozen for 2 weeks. I love chutneys in my house no dish is served without chutneys. Vama: Chutneys add the zing and can perk up any meal! What a lovely and useful thing to share; friendship and chutneys respectively!